I started treatments at end of July 2018 due to a diagnosis of Laminitis on 17 year old ex racehorse. At the beginning she was rocking onto her hinds to maneuver to feed and water but spent most of day and night laying down. Her Veterinarian recommended euthanizing her due to the severity of case. I used the “Gospel’s” Equine Light Therapy pads on her front legs and hooves weekly with body massages. By the 3rd week she was leaving her stall, eating all her feed and when I’d show up for her treatment she was nickering to me and had excitement in her eyes. After her 5th week she was hot on the lead again, when turned out she was bucking, running and acting like a youthful colt. Watching the transformation of a horse that was to be put down to being a new horse again is a very emotional event. I’m so thankful for having the right equipment to help with such a great recovery. I purchased the small light to use on my husband's horse who grass foundered. I used it daily for 1 week and then every other day for a week. When he first foundered he could barely walk, today he is acting like his energetic self. I am still using the lights and will continue. I also use it on the other horses I own. We live on a working cattle ranch so the horses get worked hard, they love it and I love how it makes them feel. My pony smiled the first time we put these on his feet. This has saved him. He has now successfully weaned off his Bute and no longer needs his Soft Ride boots to walk around. We expect him to return to work (as a leadline pony) in June. So grateful! He has cushings and is laminitic, he had a flare up this winter during the cold weather and was not recovering. Radiographs had actually improved from previous years but he was in so much pain he could barely walk even in Soft Ride boots. He has improved so much since we've started treating him with your light therapy pads. Thank you! A few years ago in December, we received a call from a woman who told us her mare had been in an accident in August. Her Friesian mare had come home Aug. 1st from training/showing with multiple skull fractures, internal hematoma, and facial nerve paralysis on the right side. The mare still could not move her ear, had a lavage system in her eye and her mouth was not working properly. This is Ivy and Susan's story. This is for my Friesian mare who came home Aug. 1st from training/showing (after 12 days at the U of Minn. Equine Center) with multiple skull fractures, internal hematoma, and facial nerve paralysis on the right side. We are doing acupuncture with a wonderful vet and have added light therapy. After about 3 days after beginning the light therapy, her eyelid was not just fluttering, but actually in sync with the other eyelid and is attempting to blink. It is not all the way yet - and may not be for quite awhile, but I see good signs of improvement and if it is like the ear, that is a wonderful sign. The ear was getting better, but has really advanced in the last week and is very mobile now. I do believe the light therapy has been of the most benefit. Oh --- the eye area also has more "tone" to it, if that makes sense and we have found that even if there doesn't seem to be ANY improvement in movement, the improved tone itself indicates that there are connections forming. She is very happy with the light pad on her forehead and the upper part of that side of her head -- below the ear and next to the eye, so she must know something. I just wanted you to know that we have good blinking now on Ivy's eyelid and today I took out the one stitch that was closing the back half of her eye. With the increased usage and muscling, the rubber stopper holding the stitch in place was now angled differently and too close to the eyeball. Ivy was so relieved to get rid of that stitch! She has had it in for quite a few months and I know it was bothering her now. I will be making an appt. soon with the U of Minn. Ophthalmology department to get her in for a checkup and take the lavage system out of her lower eyelid. If she could talk I know she would say -- please soon!! She can be a real horse fairly soon! I will continue to use the light pad for her muzzle as the deviation has gotten alot better, but has quite a ways to go yet. But at least she can go outside a bit longer, and with another horse, after the hood comes off. I am just thrilled about her eyelid!! Thanks for everything. I think the pad really helped accelerate the regeneration. There was very little movement when we started but I noticed a big jump in improvement in 3 days and it kept on getting better and better. We took Ivy to the U of Minn. last Monday for her ophthalmology checkup and new sets of skull x rays and she got a glowing report! Skull fractures look very good -- or rather have healed well -- and Dr. Gia Klaus, Ophthalmology, was SO impressed with the improvement in Ivy's eye --- FULL blink, not quite as strong as the good eye yet, but her tear production is better than the good eye! No lavage system now, no hood with the eyecup. We did graduate to a Guardian Mask just to keep dust and UV rays out until the eye is 100% - especially when she is outside for her short stints while I clean stalls. I showed your website to Dr. Klaus as she wanted to know all about it. In fact, they wrote it up in the report that I was using Light Therapy. I know Dr. Klaus was amazed at Ivy's improvement as Ivy's previous checkup with her was not very promising. I love ours. We have 2 of the small light pads and one of the large ones. The battery pack works great, too. This is our 34 year old Arab getting his 15 minute daily light treatment for ringbone. It has worked wonders for him. It has been my pleasure to refer people to Equine Light Therapy after experiencing the wonderful results on our elderly Arabian. I have photos and x-rays which I am happy to share. I have to tell you that he was in such bad shape that I had very little hope that the Light Therapy pad would help, but we had already purchased it for a different horse and I thought it couldn't hurt to give it a try. The results far exceeded my expectations. I got Zephyr after his previous owner ( a large Dutch Warmblood breeder ) who bred him found that he wasn't sellable. They couldn't find out what was wrong. He wasn't consistently lame. So unable to put their name on him to sell, they gave him to me. Coming from a Standardbred racing background I initially thought about blistering. An Ultrasound determined a tiny hole in his Extensor Tendon. I got the Equine Light Therapy pad & put it on daily for 2-3 weeks, the hole filled & healed very nicely. He's never taken a lame step since. I now have an exceptionally well-bred, talented horse. The pic (2010) is from last year showing 1st Level where he won every class we showed. We didn't show this year so we could concentrate on extensive training & show the Upper Levels next year. In the Spring of 2015, our horse Smarty Pants was struck by a stray .22 bullet which fractured his left elbow. The vet called him the luckiest horse ever because he had the potential to heal... if he had the will. It would be up to him. He was stalled for 8 solid months before he started getting a little bit of turnout time every day. Rehab began under our vet's direction with hand walking 5 minutes a day working up to 20 minutes. 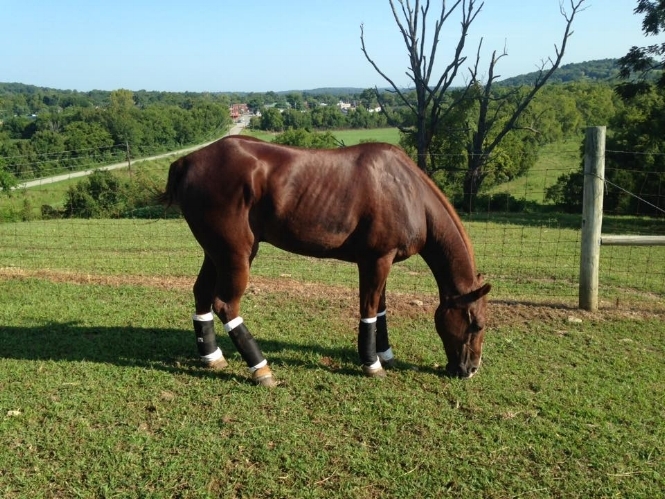 His former owner and I searched for anything that might speed up his rehab or help him become rideable again. She found the Equine Light Therapy pad and we immediately purchased the large pad and started using it on Smarty Pants. After a year of inactivity, there was a lot of muscle atrophy around the injury sight and his chest, along with a terribly wobbly knee. We used the light on every place. He began to make progress. From hand walking and trotting to light riding at a walk to where he is today, trotting the barrels and poles. Loping will begin shortly. We still use the light pad on his shoulder. His knee has a slight wobble from nerve damage but the more we use the light pad the less it presents. He is healthy and happy. Our eight year old granddaughter showed him recently at the county fair and he won his class along with Reserve Grand Champion. Thank you Equine Light Therapy, I truly believe your Light Therapy pad was instrumental in our success. Stella with a Small Light Therapy pad on each side of her neck, held in place with our Black Cotton Elastic Bandages. One of our clients treating her mare who was just diagnosed with EPM. The lip doesn't lie!! Her message to us, " A picture is worth a thousand words. She is literally crawling into my lap to say thank you." Just wanted to share how great your product is and I'm a firm believer now. My mare tore her hind suspensory and was told she would need at least 6 months off and most likely more without extra treatment. Took her back today for a check up just to make sure she was making progress (almost at 4 months). Come to find out it has completely healed and 2 months faster than what was normal for a tear like hers! I used your product 3 days a week. Thanks! 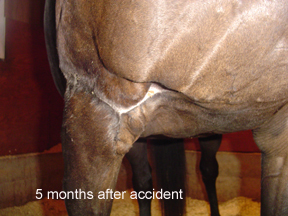 There are no documented success stories of horses who recover from this type of injury. In fact the literature says the only answer is Euthanasia. Roy is 8 months out, post injury and back out in the pasture. Those new horses must have ganged up on Roy, when I found him the next morning he was covered in bite marks, scratches from barbed wire and horseshoe prints. Roy was hiding at the far end of their pasture. I didn't realize how bad he was hurt, until Mike Caruso, DVM (Orthopedic Specialist) from Tn Equine Hospital evaluated him. The injuries were extensive : Tibial Fracture, Lateral Collateral Ligament Rupture , Disruption of Medial and Lateral Meniscus, Cranial Cruciate Ligament Rupture, and Fibula Fracture. It would be risky transporting him to the hospital and with his age at 25, added to increased surgical risk. We treated him conservatively, and one of the things we did from the start was the Equine Light Therapy twice daily X 15 minutes each session, for several months as recommended. Roy tolerated the Light Therapy well and he would move his leg around to where he wanted the Light Therapy pad. Symphytum twice a week, Massage And Acupuncture therapy, NSAIDs daily, etc also part of the regimen. Roy is 8 months out, post injury and back out in the pasture. Dr Mike said it is a miracle as Roy's bones have healed and aligned themselves on X-ray. Roy can even run at a good gait. Although he walks with a limp now, he is back to being a normal horse! Thank you for developing this awesome product! I am convinced It aided in the healing process! There are no documented success stories of horses who recover from this type of injury. In fact the literature says the only answer is Euthanasia. Roy is a very special horse, and doing well now. We both want to thank you. Update: the saga continues... Roy came down with PIGEON FEVER: Equine Distemper, his chest puffed out like a pigeon from a huge abscess, once again we got out the Equine Light Therapy pad and a regimen of betadine scrub and ointment. He is doing great! I'm really glad I purchased that Light Therapy pad as we use it a lot! 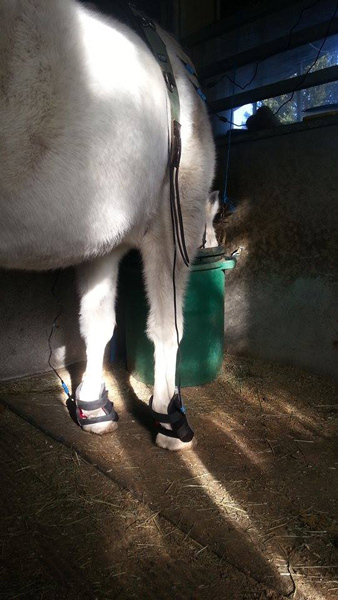 Cody with Equine Light Therapy® pads on his front feet. Cody got into the chickens' corn. That's bad for horses. He got laminitis in his front feet--severe pain, inflammation, tissue damage, edema, less blood flow and founder--a bone in his foot detached from the hoof wall, sank and was close to piercing the sole. Poor prognosis at 25 years old. I had read that LED light therapy reduced inflammation, helped reduce pain, increased blood flow, accelerated new cell and tissue growth, reduced swelling and edema, and encouraged the body to clean up dead tissue and bacteria reducing the chance of abscesses forming. He needed all those things to happen in order to heal. For two weeks I put the LED light therapy pads on the front and back of his front feet 3x/day. For 4 more weeks 2x/day. And then 1x/day up until now. At 4 weeks he walked out of his stall to roll in the snow. At 6 weeks he was walking balanced and comfortable. He even ran and bucked briefly. At 7 weeks the farrier trimmed his hoof and hammered new shoes on him. Didn't flinch, looked unconcerned. It looks like he is going to recover well. 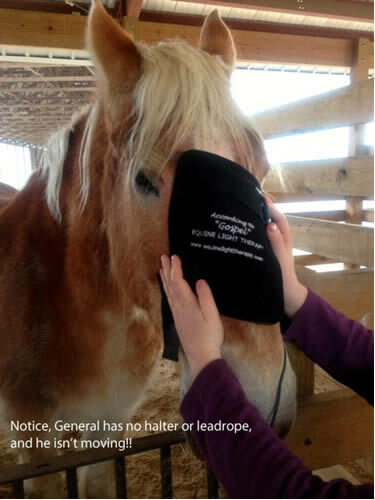 Thank you Equine and Canine Light Therapy for your wonderful light therapy pads and your advice. Thank you God for watching over Cody and helping me know what to do. 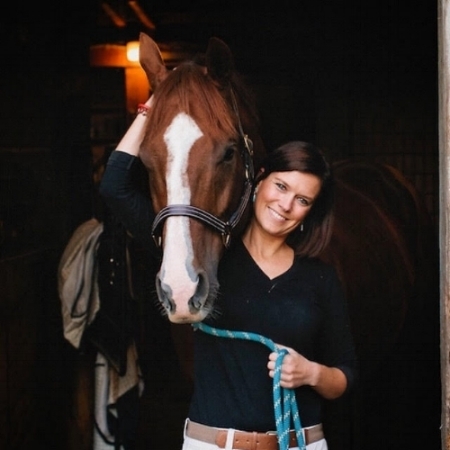 Louise S.
I am a nationally certified equine massage therapist and I planned to use the light therapy pad on my clients who had extremely tight muscles, in order to allow for deeper work. However, right after I ordered the pad, my own thoroughbred slipped on some ice in his paddock injuring his stifle and severely tearing his hamstrings. I could actually see his muscles spasming continually even through his blanket, and he was in a lot of pain when asked to move. As soon as the light therapy pad arrived, I used it on his hamstrings and saw immediate improvement. Over the course of a week, I used the light pad everyday and my horse loved it. He began to actually maneuver himself to show me where he wanted the pad used, and I truly believe he recovered much quicker than he would have without the use of the light therapy. Everyone at my barn is now asking to borrow my light pad for various reasons, including muscle tightness, laminitis flare ups, and even simple sensitivity issues. I also have incorporated it into my professional massage sessions and notice how much deeper I can get into the muscle without having to spend as much time warming up the muscle fibers! I'd recommend this pad to everyone! We have a nasty ligament injury on a wonderful barrel horse (and friend) and I'm praying this will help the healing process (along with stem cell). ….we have a "Thankful" sign outside his stall...goodness we love that boy. Thank you for investing in these amazing creatures, your work is wonderful. Big day for Libbie last week- she can at least walk him. 90% tissue regeneration. 3rd ultrasound behind us. He can trot 5 minutes a day and be out to wander (if we are watching :). Vet says Libbie will be up in May. Heart is full- Ace is so much happier when he's free to be a horse. Thank you so much! I just wanted to share my latest and greatest experience with your light therapy pad and share a photo. I use two large pads and have for years working with sports massage and acupressure for both dogs and horses. Recently one of our painted desert rams locked horns with a much bigger mouflon ram that proceeded to drag him over many acres - twisted and slamming and dragging him around. The smaller ram was in horrible shape when we got them separated (not easy with two wild animals!) My latest patient is Ethan - he could not turn his head without extreme pain and had very thick swelling. He was uneasy about any interaction until I began massaging his back and neck and once the pad went on he relaxed and softened his eye and I just sat down next to him. I wanted to share a picture. Thank you for your amazing product- I have a lot of equipment and this is what I go to every time! Thea is a 19-year old Norwegian Fjord horse in Germany that still teaches young children how to ride. One day Thea limped in her hind leg. The vet came and every time she touched Thea on the flank, her hind leg started to shake, and she barely put it on the ground. The vet x-rayed her leg but the pictures didn’t show anything, and the vet couldn’t figure out what was causing the pain. So the owner put her in a separate stall and gave her rest. He considered putting her down if her condition didn’t improve quickly. We bought the Equine Light Therapy pad for our own horses, and when we heard about Thea’s condition and fate, we tried it out on her. Twice a day we put the pad on her flank, her lower leg, and her spine. Within two weeks’ time, Thea recovered. Every day we noticed how she put more weight on that hind leg. After three weeks we asked the vet to palpate Thea’s hind leg again, and she couldn’t recognize any pain points and discomfort in Thea. Thanks to the Equine Light Therapy pad, Thea made a quick recovery, and she is back to work bringing confidence and joy to young children. I think Luca's lip says it all! This is Luca, a 6 yr old KWPN gelding that we imported from Belgium. Almost the minute he landed we started using the light pads and as you can see he loves them🐴😊 . I wouldn't even want to imagine not having these to be able to use on my horses!! Thank you for developing According to "Gospel" Equine Light Therapy pads ! I would like to tell you a story about my mare, Raven. She is now 18 years old and I raised her from a baby. Last year she had a severe injury to her back, to this day I don’t know how she did it. I called my vet right away and he had a chiropractor work with us. Not only was she getting treatments from him, I was doing therapy in between his visits. We did this for a couple of months with very little progress. He told me I should think about putting her down. Of course, I was not ready for that. My vet had just gotten a laser light and asked me if I would like him to try it and see if it did anything. Right away I could see relief in my mare’s eyes! We did 10 treatments with continued success. I then began to do some research about Light Therapy and I found your website. I’m so happy I’ve found a solution, not only does your light keep her pain free, I am now able to ride her lightly. Thank you again for a wonderful product! Several years ago my Preliminary horse bowed both front tendons on a muddy cross country course. The vet's words were, "I am very concerned about this injury. It could possibly be career ending." Obviously I was devastated and I was committed to giving this horse the best recovery possible. 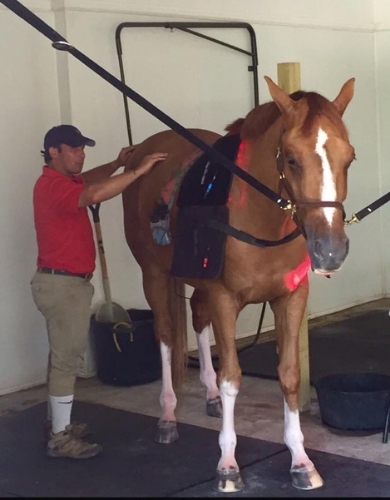 I began using the Equine Light Therapy pad twice a day on both legs. Along with a very strategic turnout schedule and a slow, progressive conditioning program, in a year he was competing again! And in just over a year he was back at the Preliminary level. I truly believe he would never have made such an astounding recovery without the light therapy pad. He returned to competition better than ever! Now, when I feel his tendons, I can't even tell he bowed! Totally amazing! In June 2007, my horse, Rillian, sustained an injury to his medial front right foot by way of a barbwire fence, that cut him deeply from the coronary band all the way around to between his heel bulb, and severing a digital artery. Fortunately, this awful injury healed with just a scar, and by August 2007 I was just able to start riding him out for easy walks while he, of course, was observed cantering happily across the pasture! After a period of getting him back into shape, we were back to our regular endeavors of trail riding, jumping (small fences) and foxhunting. Everything was going quite well, although he showed some intermittent lameness in his right front, which I just attributed to the aftermath of his injury. To make a long story short, in September of 2008, an ultrasound found a tear of his straight distal sesamoid ligament—as a result of his mechanism of injury—which had partially healed during the two month’s of recovery from his laceration. But since then we had been riding for 13 months and it never completely healed. Rillian lives in a small herd on 40 acres with 24-hour turn out and a run in shelter. No stall. Our vet’s suggestion for this now chronic injury was stem cell therapy, however that was not practical in our situation. The practical option was turnout, for what the vet estimated would be 12–18 months. That’s when I researched and purchased your Equine Light Therapy Pad. I had experienced red light therapies in other applications, and when I saw your pad I felt it would work for this injury. Starting in October of 2008, I applied it around the back of his pastern every morning at feeding time, for about 10 minutes. Both vets who saw him 5 months after the diagnosis and the beginning of the light therapy were quite surprised at his recovery rate and, without asking any questions, just said “keep doing what you’ve been doing” and left it at that. By early May of 2009 he was not showing any signs of lameness and I began riding him again. The ligament that had been torn for over a year was able to heal itself, and I have no doubt your light therapy pad helped that happen better and more quickly than it would have otherwise. Update: 2016. He is 20 years old now and still going strong, without any signs of lameness, and we are still enjoying all the types of riding we do. But it’s a toss up as to who uses the pad more—the animals or the humans in our family! Thank you for your technology and support. My “Gospel’s ” Equine Light Therapy light pad has become a large part of my Equine Therapy practice. At the 2010 World Equestrian Games, I was blessed to be a member of the official therapy team available to all of the participants. Our services were available to anyone who signed up in the Vet clinic. We were going to work on the Para Dressage horses from the South Africian team. The team manager met us to see what we had to offer. We were explaining all of our modalities including therapeutic ultrasound, electric muscle stimulation, laser, infrasound. She looked down at our bags and exclaimed, “you have According to Gospel Equine Light Therapy pads! !, we use this at home. Go ahead and do whatever you need to help the horses”. It gave us instant recognition and trust. So we wanted to thank you for opening a door for us. Recently, our clients in the 2011 Breeders Cup Championship finished with 1 win, 4 seconds, and 6 thirds. Your technology was a part of our success on the biggest day in Thoroughbred horse racing. Thank you so much for being a part of our successful therapy practice. We got our mare, Fever Reliever, when she was coming 5 years old, she came from a big race stable and was very sore through her hips and loins due to training and racing on an artificial surface. She was dull and depressed and in a lot of pain. We tried several different therapies on her until we learned about light therapy. We bought the Large Equine Light Therapy pad for Fever and began treating her with it. She loves the pad and relaxes completely while she is being treated. 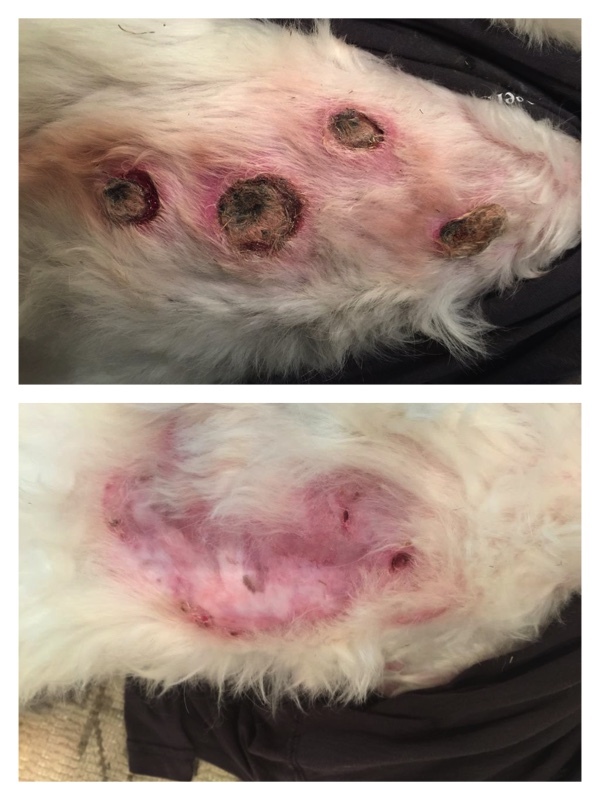 We have seen a significant improvement in her back since she has been using the According to Gospel light pad! Thank you for your continued support and service you provide for us, we are satisfied and grateful customers. Here is my donkey having her light treatment for a sore foot. She had chronically foundered for years and we brought her to our home for rehabilitation. She is doing very well -- thank you so much for your Light Therapy Pads! They make such a difference with speeding up the healing process. The donkey loves her treatments. At first she wasn't sure about it but as soon as she found out how good it feels, she was more than happy to cooperate. We have rehabilitated a lot of navicular and foundered horses and sore feet in general and have found the Light Therapy Pads help tremendously. We always use the lights with abscesses, sore tendons, sore muscles, laminitis, mud fever and wounds. We use the lights on anything that hurts and are very pleased with the results. Just wanted to let you know I really like using the light pad on the horses. The day after I use it on my horse he is much less stiff and he really seems to enjoy me using it on him. He is not a very "social" horse toward people but stands quiet and calm when I use it on him. Team roping is very stressful on a heading horse because of the jerk and weight of the steer. I think the light pad has really helped relieve some of his aches and pains. General, a 14 year old Belgian gelding, has had excessive saliva for at least 2 years. Sometimes he also has nasal drainage, typically clear or white. Around October 14, 2012, he started with drainage only on the right side. By October 17, the drainage was thick and was extremely acrid. Being concerned about a guttural pouch infection, we took him to the vet and had an endoscope done. The guttural pouch was clear. At the recommendation of the vet, we put him on 14 days of oral antibiotic for a sinus infection. The smell was gone after 2 days and the drainage was clear after 10 days. We completed the treatment of 14 days. General remained clear of nasal drainage for about 8 weeks. At the end of December, nasal drainage returned, again primarily from the right nostril. About January 1, 2013, the acrid smell also returned. Being hesitant to go back to another round of antibiotics, having only remained clear for 8 weeks, I decided to try the recently purchased Equine Light Therapy pad over General's sinuses. He received 10 minutes of treatment every day for 3 weeks. Within 48 hours, both the smell and amount of drainage had drastically reduced. In less than a week, all symptoms were gone. I also noticed that his ongoing issue with excessive saliva was greatly improved. I am currently reducing treatments to 3 days a week and will gradually reduce to fewer, and possibly discontinue, depending on the response. Using the Equine Light Therapy pad for this purpose was an unexpected bonus for us. Girl Scouts of Middle Tennessee maintains a herd of around 40 horses. It is not uncommon for our pasture kept horses to have minor strains and sprains from playing, muddy conditions, or work-related injuries, especially in our older horses who have had previous careers. The purchase of the light pad was intended to be an alternate treatment for such conditions. We are delighted at the success of this unconventional treatment for General. Hi my name is Taffy. I am a Paso Fino, my mom and dad in the horse world are both buckskin so that is why I am light but I am not white. I foundered in both of my front feet after a 3300 mile ride in a cold trailer truck on our way home from California. All I wanted to do was lay down because my feet hurt. My mom and dad of the people world tried everything they could find to make me comfortable but nothing made all the pain go away. I know it hurt them as much as it did me and it got to the point that they were thinking they would put me down. They tried to not talk about it in front of me because they know that I understand them. Then came the Equine Affaire at the Big E in MA and they found a device that uses light to make my feet get better and it has saved my life. I can go out every day now and run like the wind again. Thank you According to "Gospel", EQUINE LIGHT THERAPY! I am very pleased with the results after using the EQUINE LIGHT THERAPY pad on my 7 year old Reining Gelding LEAN ON CHEX AKA : MR WILSON. It was the beginning of July 2009, I will never know how the injury occurred but the end result was a dead lame horse a month before my next Reining show. After many x-rays and tests it was determined he had suffered a trauma to his fetlock and had bone chips in the joint. I immediately located a Qualified Surgeon capable of performing Arthroscopic surgery on Wilson. The surgery was August 12th, 2009 and he came home a week later. Although the surgery went well we soon we hit a bump in the road to recovery with a recurrence of an infection. This is was an off and on battle with antibiotics and highly stressful over the next few weeks. I thought of what I could do to help the process of recovery so I began to research light therapy treatment options. This is when I came upon the "According to " GOSPEL" Equine Light Therapy" website. After comparing and reading about other similar products out there I decided that this was going to be the best choice for me. I read all the stories and asked lots of questions of Christina and she was extemely helpful and patient with me. ONCE I received the pad I started using it twice a day for 8 - 10 minutes. He fussed a bit but soon began to look forward to it and would stand nice and quiet for treatment while I did the barn chores. I even used it on a really badly capped hock he managed to get while he was on stall rest. Within a few days the huge swelling on his hock had gone down and by the end of two weeks the injury was gone and he looked 100% normal again and I was so relieved to see the results. Time marched on and he had a set back due to a self inflicted injury again. He had been playing in his stall and rolled the ankle so to speak , and was swollen again and limping worse. We hauled him to our vet and after an ultrasound I was told that he had a lot of fluid on the joint and things did not look promising. I was told he had a very low chance of returning to the show arena again as a Reining horse and likely not even a sound trail horse. I was devastated to hear this and could not give up on Wilson as I had a lot invested in him. I continued the treatment plan which included the light therapy pad, a specialized diet to support recovery and overall improved health and I hoped for a better outcome. More time passed and Wilson was looking and feeling better and I him to the Vet for a check up, x-rays were done but this time things looked promising. Both the Vet and the Surgeon that had done the operation viewed the x-rays and were very pleased to see that there was no joint deterioration or signs of arthritis and they gave a thumbs up to start a rehab program. It has been almost three months since that good news and I have slowly brought him along on an exercise program in hand with a return to a full-time conditioning program with a Trainer in March. I sent his light pad along and he has a treatment after each session to help control any swelling that may occur. I am happy to say that I have my boy Wilson back attitude and all. He looks great but more importantly he is coming along and is really wanting to do those sliding stops. I finally had to put sliding shoes on him to give him something to slide with. I rode him for the first time last week and he feels fantastic and I did not notice any change to the movement at all gaits. I feel the Light Therapy pad was an important component in Wilson's rehabilitation plan and I will continue to use it for years to come. I find it helpful with any chiropractic care he receives and many other surprises that happen with horses. Thanks for the great product! Copy of Wounds are almost closed in one month. Copy of Equine Light Therapy heals wounds fast! Copy of Older dog with debilitating infected fatty tumor. Copy of Massive wound to horse right front leg. 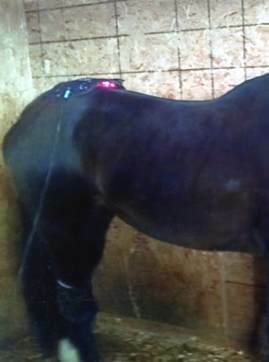 Copy of Wound closed, leg functional again by using Equine Light Therapy. Copy of Healed with Equine Light Therapy; no scar or white hair.